Do you have a legal problem but no lawyer to help? Then you could be one of the growing number of Canadians going to court alone. Between the rising cost of hiring a lawyer and cutbacks to legal aid, more and more people are faced with either representing themselves, or walking away from their legal problems. But what if I told you that with some hard work, it was possible to manage your own case and reach an outcome as good a if you had been represented by a lawyer? No one knows your case better than you do – but you need to learn how to prepare and present it. Journey to Justice A practical Guide to Effectively Representing Yourself in Court will show you how. Travelling from one guidepost or “waymark” to the next, you will learn how to take all the bits and pieces of paper you now think of as you case and turn them into an organized presentation in court. If you are on your own with a legal problem, this book is the compass you need. Denice Barrie has been providing coaching and support to Self-Represented Litigants since 2007, and has seen them achieve some remarkable results. Journey to Justice combines her 30+ years of experience as a lawyer in both BC and Ontario with her passion for making the doors of justice open for all. In this short, straightforward guide, she maps out the unique, 6-step system she has developed, while sharing lots of insider tips and stories to help you along the way. Writing with compassion and understanding for those who find themselves alone on the sometimes rocky road to justice, she takes you from chaos to convincing, one waymark at a time. Great Reviews for Journey to Justice! Thank you for your letter and for the copy of your book, A Practical Guide to Effectively Representing yourself in Court. I was pleased to learn that, in some small way, I may have played a role in the book’s conception. Congratulations on this accomplishment. The more litigants understand about the trial process, the closer we come to access to justice. We are delighted to recommend a new book written by SRL coach, lawyer Denice Barrie (www.waymarklaw.ca) from Gabriola Island, B.C. 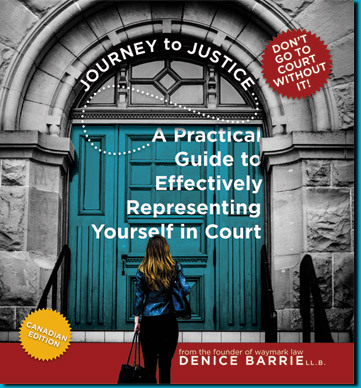 Titled “Journey to Justice: A Practical Guide to Effectively Representing Yourself in Court”, Denice’s book is packed with practical ideas, to-do checklists, and supportive tips that draw on her extensive experience in legal practice and of working with self-represented litigants. “Journey to Justice” is organized in six sections that walk a SRL through the process of bringing their legal matter to court. The six steps are: Collect – Organize – Co-ordinate – Strategize – Prepare – Present. Written in clear and straightforward prose with many examples, sample questions and materials, and with the text broken up by excellent graphics throughout (including some cartoons), “Journey to Justice” speaks directly to SRLs. Barrie’s book does not sugarcoat the challenges of self-representation, but accepts their reality in a way that will be music to the ears of many SRLs. Its one deficiency is its somewhat slight treatment of settlement and negotiation strategies, but to be fair, the focus here is on the “how-to’s” of the litigation process. Read alongside NSRLP’s “Settlement Smarts for SRLs” (which can be downloaded for free), the books are a perfect pairing. You can order “Journey to Justice” through Amazon (that’s www.amazon.com – note that the book is presently not available on Amazon.ca but is coming soon) for $19.95. Watch Denice being interviewed about her book here. Newsflash: Chief Justice Beverley McLachlin has written to Denice congratulating her on her new book and commenting that “The more litigants understand about the trial process, the closer we come to access to justice”.